VA is budgeting $850,000 per year to run this Advisory Committee on Disability Compensation. See Paragraph 7 of the Committee Charter. That means, since 2010 when the committee was started, VA has spent $5.1 Million for something you probably have never heard of. I have contacted VA multiple times to find out if the Washington, D.C. meeting can be webcast (as other agencies do) so the public, including Veterans, can follow the proceedings. After all, the Advisory Committee is going to hear two days’ worth of information from VA about disability compensation. Disability compensation is kind of important. It’s a public meeting. Why shouldn’t the public be able to find out what’s going on? So far, VA has been silent, failing to respond to either voice or e-mail inquiries placed since September 30, 2015 to their designated contact person. 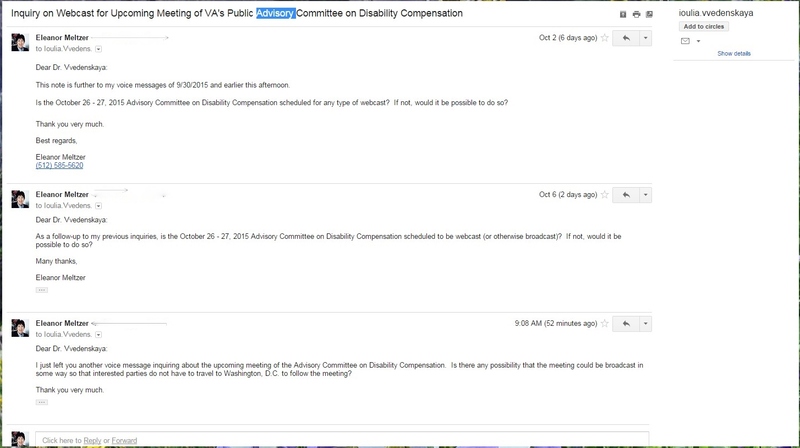 Update: On October 13, 2015, VA’s Advisory Committee liaison, Dr. Vvedenskaya responded to my e-mail messages. Dr. Vvedenskaya indicated she had been out of the office for two weeks, responding upon her return. Dr. Vvedenskaya confirmed that the Advisory Committee’s October 26 – 27, 2015 meeting will not be broadcast in any manner. At this point, unless you live in the D.C. Metro area and can take time off from work, it’s unlikely that you will be able to attend the public meeting. Last year, almost certainly for the same reasons, not one member of the public attended. From years of experience, I can tell you that public presence at advisory committee meetings makes a difference. First, it lets both advisory committee members and agency employees know that there’s real interest in their activities. Second, with members of the public present, “inside jokes” and procedural sloppiness are minimized. Finally, agencies are spending your money on the meetings. Daylight, in the form of immediate public presence, generally encourages agencies to be more responsible with their budgets. If you would like to attend the meeting, here are the meeting particulars. As of this posting, no agenda for the meeting appears to be publicly available. The meeting is in a government building. That means you have to have a photo I.D. with you. Allow at least 15 extra minutes to get through the clearance process at the Guard’s Desk. The Advisory Committee on Disability Compensation (“Committee”) provides input to VA on maintenance and periodic readjustment of VA’s Schedule for Rating Disabilities (VASRD). The Committee is charged with reviewing information on the nature and character of service-connected disabilities. The Committee is also supposed to assess the effectiveness of the VASRD and give advice on the most appropriate means of responding to the needs of Veterans seeking disability compensation. By Email: Ioulia.Vvedenskaya@va.gov Dr. Vvedenskaya’s telephone number is: (202) 461-9882. Can’t get an answer from VA? Have you been denied a disability rating – or given a rating that does not accurately reflect the impact of your disability? You do not have to fight the fight alone!